Wooragee Primary School is the recipient of the 2015 Kevin Heinze Perpetual Award for school garden excellence. The late Kevin Heinze was the face of gardening in Victoria for many years, as host of his popular “Sow What” program. 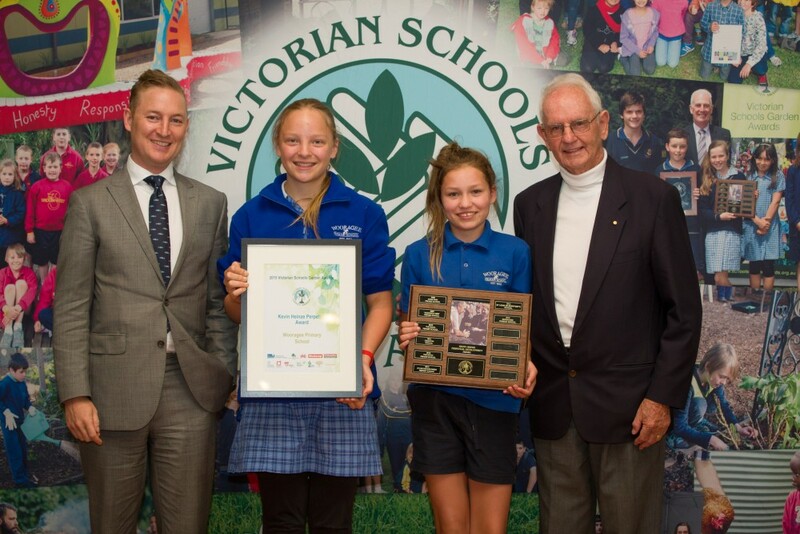 Now in its 38th year the Victorian Schools Garden Awards (VSGA) are a direct legacy of Mr Heinze, and in 2015 the program distributed in excess of $40,000 in awards to winning schools. Wooragee Primary School is a tiny school doing amazing things. With just 13 students the school has a garden class every week led by their 85 year old head gardener. They have a kitchen program where students learn the art of cooking and preserving the produce they’ve grown. The Award caps off an amazing year for the regional school located near beautiful Beechworth in North East Victoria who are renowned for being an environmentally friendly school. 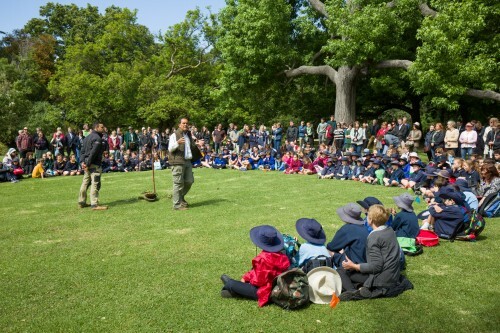 Over 350 school children attended the Awards ceremony held at Melbourne’s Royal Botanic Gardens, on a day where Melbourne showed all four seasons in one but nothing could damped the spirits of the representing schools from all over Victoria, who had successfully navigated through rounds of judging in the various categories. Through their enthusiasm and participation, 125 Victorian schools entered, reflecting the increased importance placed on the development of school gardens as teaching resources, and the value of green-space in creating healthy surroundings, conductive to learning and life. Chris Keating from the Victorian Department of Education and Training presented the State Awards and Kevin Heinze Perpetual Award alongside Paul Crowe OAM, VSGA Patron and co-founder of the program. After a month of viewing and judging all 125 Award entries, the VSGA committee is happy to announce the Regional Award winners for 2015 . Finalist schools have now been contacted and have to wait until the VSGA Presentation Ceremony on 26th November at the Royal Botanic Gardens Melbourne, to discover whether they have won a Category Award, State Award or the grand prize – Kevin Heinze Perpetual Award. We would like to take this opportunity to thank all the schools who entered the Awards this year and encourage all those schools who were unsuccessful or who didn’t enter this year to start thinking about 2016. On 4th September, two weeks before the end of Term 3, the Victorian Schools Garden Award entries for 2015 closed. This year saw another increase in entries, with 125 received from schools across Victoria. Judging of the Awards has begun, the VSGA committee are extremely impressed with the entries submitted and the effort schools are putting into their gardens. It is clear that schools take their outdoor environment very seriously and see the benefits of integrating outdoor learning into their curriculums not only for student learning but also health and well being. Regional Award winners will be announced around the end of October with all other categories including the Turf Victoria, Flemings Mini Orchard, State and the Kevin Heinze Perpetual Award being announced at the VSGA Presentation Day held at the beautiful Royal Botanic Gardens on Thursday 26th November 2015. This year’s VSGA grant applications closed on Friday 24th April. The VSGA received an amazing 230 entries from schools vying for 1 of the 8 grant categories available. As with last year’s entries, the judges were impressed with the quality of applications submitted and the amazing gardening projects proposed. Some categories proved to be more popular than others with edible garden and maintenance grants being highly sort after. It was extremely difficult selecting the successful recipients. From the increase in grants submitted this year, it is clear school gardens are fast becoming seen as an important part of schools infrastructure, not only for appearance purposes but as outdoor classrooms. Once a place for playing, school gardens now play a crucial role in hands on learning. Whether successful or not, we hope all school garden projects will come to life and outdoor classrooms and classes continue to grow in all schools. Please press here for the 2015 VSGA Grant Results. On Friday 27th March, the last day of Term 1, 30 teachers attended a VSGA ‘Teachers Involved in Gardens’ professional development workshop at the Melbourne International Flower and Garden Show. Prior to the workshop, teachers participated in the 2015 VSGA program launch by Deputy Premier and Education Minister the Hon. James Merlino. 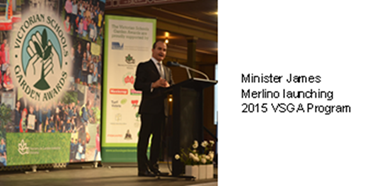 It was promising to hear Minister Merlino recognise the value and importance of school gardens in education. The VSGA is grateful for the government’s continued support of our program which shows that gardening and environmental practice can significantly contribute to a student’s educational journey. The workshop itself began with Bill Thomas, Head of Sustainability at Bentleigh Secondary College (BSC), sharing his journey and successes at reducing the schools impact on the environment. One example shared was their construction of a wetland area on school grounds to capture the excess storm-water that couldn’t be harvested by the tanks. This water is treated and channelled to a sub-surface irrigation system that irrigates one of their playing fields. The wetland also improves the sites biodiversity providing valuable habitat for flora and fauna. Bill encouraged teachers to approach businesses for help with any projects. Fabian Capomolla, our next presenter, co-founded The Little Vegie Patch Co. a nursery which focuses on helping people set up their own veggie patch and all things edible. Having assisted many families, businesses and schools set up gardens, Fab shared his three elements to setting up a garden – Location – Soil – Plants. One suggestion on how to save money was to plant straight into the ground, “garden beds don’t have to be raised”. With limited funds for gardens, Fab suggested growing directly in the ground and use money saved on vegetation. Fab also shared ideas for raising funds for school gardens – grants – ask local businesses – fund raising. Having been a nursery owner, Fab recommends asking local nurseries for old stock which they are often happy to get rid of. The terrarium building segment was led by the BSC’s “Green Machine” student representatives, who taught the teachers in a role reverse the finer details on how to make a terrarium in a 2 litre drink bottle. Once shown by the students, the teachers got to get their hands dirty and build their own terrarium. After the workshop teachers were free to explore the Melbourne International Flower and Garden Show to pick up more handy and helpful tips and ideas from exhibitors and garden displays. Hopefully all attendees returned to school in term 2 full of fresh ideas and motivation. The VSGA would like to thank Paradisia who kindly donated all the plants for our terrariums, Fiskars who donated the trowels for the teachers to use and keep as a gift and VISY who provided us with damaged bottles to use for our workshop. (Please press on the highlighted company names to be taken to their websites and support them in return for any gardening needs). Also a big thank you to the BSC’s Green Machine students, Bill Thomas, Fabian Capomolla and Basil Natoli for sharing your time, gardening expertise and inspiring us to continue with our garden journeys.